I haven't painted for a while but have been kept busy with other things. One of those things involves my son who purchased a drone last December. Since then he's been hunting for places to fly it and capture some of our amazing scenery in video and photos. If you want to see our Great Southern region like you've never seen it before, you really should check out his Drone Video Youtube channel. The reason I've been busy is because I've accompanied him on several of his trips from Denmark to Albany. For the last three weekends we've also completed a few of the walks in the Porongurup and Stirling ranges. The first was Devils Slide, which at 650m above sea level is the highest peak in the Porongurup Range. We took the track which starts near Waddy's Hut on the south side of the range. This is the shorter of two approaches, but it's also steeper. The first section of the walk follows the Wansborough Pass which is a track wide enough to drive a vehicle through. Although it is closed to public traffic, I assume it is still used for maintenance access by the ranger and for fire control when needed. This track tested our resolve from the very start and reminded me how long it's been since I put my legs under any real pressure. I'm not the fittest person I know. The end result, however, was worth the effort. The photo above shows the view from near the top of the Devils Slide walk. It is much more impressive than I'd previously thought. I'll be going back as often as time allows, as it only 15-20 minutes from home and I'd like to see it at different times of the day, in all seasons. 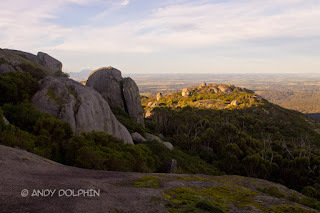 Yesterday we visited the Stirling Range and tackled the Talyuberlup walk trail. This is a fairly steep walk and had a few dodgy spots where the track has eroded over the years leaving large steps that pose a small challenge when you have short legs. Plus, there had been rain earlier in the dayso there was a bit of slippery mud to add a little interest. But we made it to the top, some 783m above sea level, and took in one the most spectacular views I have ever seen. It's funny, no matter how much grumbling my legs, back, lungs and heart do on the way up, it all goes away the moment the interesting bit is reached. Suddenly the next climb, even when it's a near-vertical scramble up a rock-filled crevice, looks trivial compared to the far-less-interesting and energy-sucking track that leads up the side of the mountain. The Talyuberlup walk starts to get interesting about two-thirds of the way up, as the bush gives way to craggy rock formations. The last section of the walk takes you around the cliffs that form the peak until finally turning up through a tunnel which requires arms and legs to conquer. The view from the north-facing exit to the tunnel can be seen below. This photo was shot with my DSLR, not with my son's drone. Magog from Talyuberlup, Stirling Range. Talyuberlup is sublime. I'm advised there are better views in the range, but I think this must be one the best views accessible to the average person not particularly skilled in bush walking and climbing. I'm not sure where we're going next, but I think that view will take some beating. When I'm fit enough to do it, I hope to take some paint and brushes up with me, and hopefully capture some of that magic in oils.